Ceramic or porcelain tile has long been a favorite of homeowners - particularly in rooms like the kitchen bathroom or entry way. Tile flooring is easy to maintain, water resistant and durable enough to handle the toughest traffic. Those same qualities make it a fantastic, trendy wall covering! Consider placing tile on an accent wall in your home, as a backsplash, or perhaps on all the walls of your bathroom. 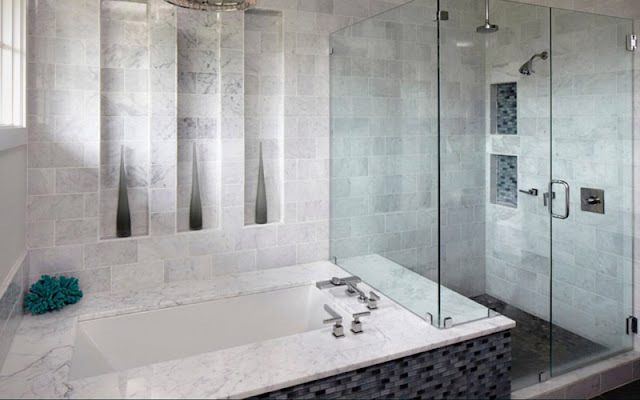 The most common space for a tile wall is the bathroom. Tile is a natural for bathroom walls because of the high moisture levels in a typically small space. Tile stands up to the moisture and is easy to clean. You don't have to use the same tile on the wall as you use on the floor. Consider using similar colors but different sizes or even different materials - perhaps porcelain tile flooring with glass tile panels on the walls. Whether as a backsplash or as a full wall, tile can create a beautiful and practical work of art on your walls. Some tiles come with printed designs on them so you could use small tiles to build a frame and then use the designed tiles within. You could also use tiles of any size to create a wall mosaic that ties together different colors in your home decor. This can be particularly striking as an accent wall in a dining room. Which types of tile are best for your wall? You'll want to stay away from large format tiles or some materials such as slate simply because they are too heavy to stay up on the wall. Beyond that, any type of tile that you like can be considered as a wall covering. 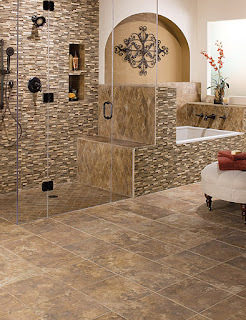 Learn more about types of tile from Indianapolis tile store, Kermans.